Four hundred and twenty three days ago, Dutch national football team members were celebrating a third place finish at the 2014 FIFA World Cup in Brazil. Winning the bronze medal was perhaps not the ultimate goal for Louis van Gaal's side, but a third place in the biggest tournament in the world is not a bad result at all. Fast forward two months and the Dutch national team found itself in Prague, contesting its first Euro 2016 qualification match against hosts Czech Republic. Having been drawn from the first pot as the third highest ranked European team, there was little doubt that The Netherlands would be able to qualify for the tournament in France. Perhaps the Czechs were seen as the toughest hurdle the Dutch would have to pass, or maybe even Pavel Vrba's side would not be strong enough to hold off the Oranje. After all, leading up to the 2014 World Cup tournament Holland came out of their qualifying group practically perfect with just one draw and nine wins from their ten matches. That and the fact that the 2016 Euro's were the first to expand the tournament to 24 instead of 16 teams, the Dutch were in many minds going to cruise right through. That day in Prague proved otherwise however. The Czech's put Holland's weaknesses on display and questions were being asked from the very start. A 2-1 defeat to a good Czech side on the road may not have been a ludicrous result, but what followed may as well be called a disaster. After Czech Republic the Dutch came home to host minnows Kazakhstan, a team that over the qualifying campaign proved to be the worst in the group. The Kazakhs scored first and held on to a 1-0 lead in Amsterdam until Holland piled on three of their own in a span of 20 minutes in the second half. Despite conceding the first goal, life in the KNVB seemed to be back to normal. Guus Hiddink who replaced van Gaal after the 2014 World Cup would last just four more qualifying matches. In those four games an emphatic 6-0 win against Latvia and again a 2-0 victory against the same opponents on the road were seen as a given. It's the other two matches that would end Hiddink's stint with the Dutch this time. After their win at home to Kazakhstan, Holland travelled to Iceland. 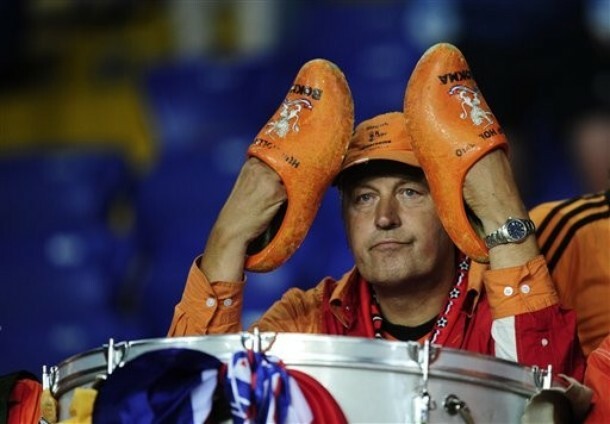 The hosts managed to keep a clean-sheet and send the Dutch home with their tails between their legs with a 2-0 defeat. 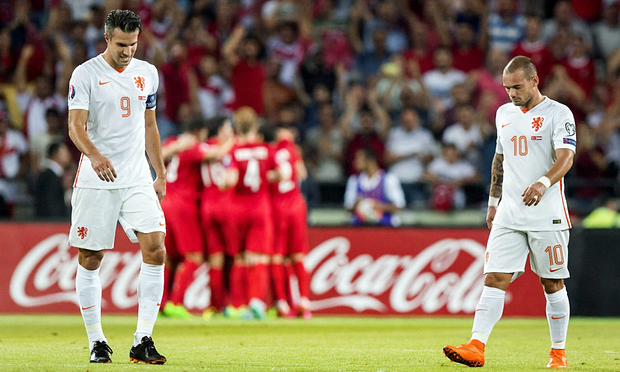 The other shaky result was a 1-1 draw with Turkey in front of nearly fifty thousand home fans at the Amsterdam Arena. Former Dutch international Danny Blind was named as Hiddink's replacement. His first test was a home date with none other than Iceland and then off to Turkey, head on clashes with the two teams that put his predecessor out of a job. Despite their superior statistical numbers against Iceland the Dutch paid the price after a stupid red card for defender Martins Indi saw Iceland go 1-0 up on a penalty and winning the match having been able to keep the hosts off the board. Needless to say the result came as a shock to the Dutch and European football fans alike. 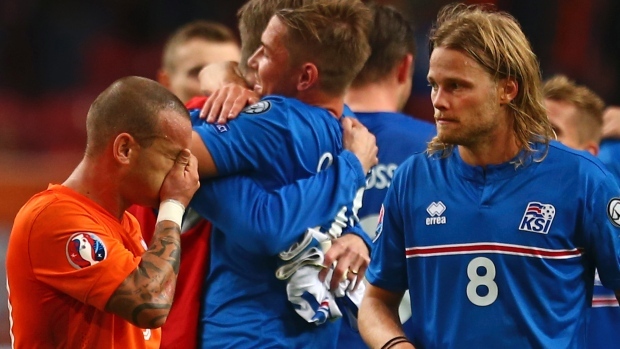 Second meeting with Iceland equalled the second time Holland could not score past the island nation. Against the Turks in Konya it was a different story altogether. Three goals from the home side and again the men in orange (or in white on this particular day) could not score a single goal and the message was clear; the Dutch are in trouble! With two matches to go in the qualifying campaign Holland's only chances of competing next year in France will be over the playoff faze of the competition as both the Czech's and Iceland have secured their places as the two top seeds in the group. The Dutch are currently sitting in fourth place, two points behind the Turks for that all important playoff spot. Their only hope remains the fact that Turkey will play a bit of a harder schedule in their remaining two matches as they will have to take on the two teams occupying the first two places in the group. While the Dutch also have to face the Czech Republic however, they still have a date in Astana, a match against weak Kazakhstan which may prove crucial to Holland's qualifying chances.